Also known as "Count Dracula and His Vampire Bride" this is one I was supposed to watch in 2010 when I did mini-Dracula thon. My disk was a piece of junk and the movie never worked. No big deal really, I had seen it back in the 70s or 80s. But I always wanted to re-watch it. I loved the scenes of Satanic Black Mass combined with vampire mythos. Plus I really liked (then and now) the idea that the descendants of Van Helsing keep popping up to fight Dracula. This time we are treated to "Lorrimer Van Helsing" and his granddaughter Jessica. Ah the mental gymnastics I went through to figure out modern Hammer canon and Marvel Comics Dracula Canon; Jessica Van Helsing vs. Rachel Van Helsing. Rachel was either Jessica's daughter or her niece. But that is just my crazy head-canon. Additionally there was the high tech/medical science aspect of this. It is takes a lot of influences from James Bond (which also had Christopher Lee as a bad guy). This movie is also so in tune with the 70s occult revival it is hard to know nearly 40 years later which influenced which. There really is a lot I love about this movie. Christopher Lee as Dracula and Peter Cushing and Van Helsing, really it is the best team up in the history of the genre. The bit about the "Undead Sabbat" is a little silly, but the bubonic plague is a nice way to up the ante a bit. 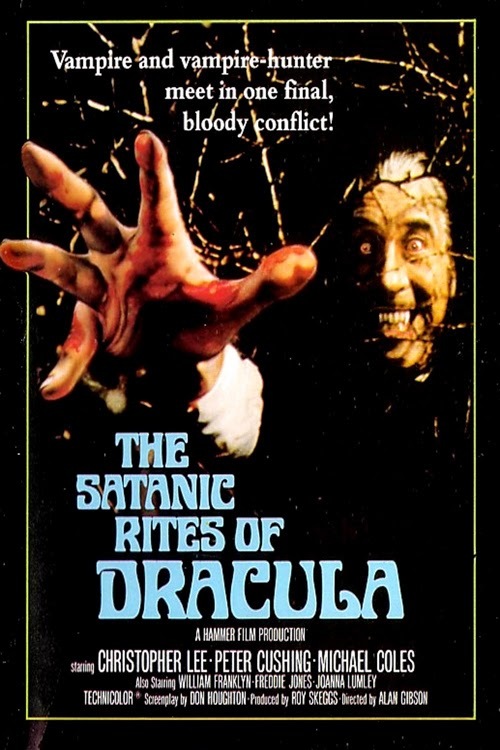 I used this movie as a basis for my introduction of Dracula to Mutants & Masterminds. What do you find scary? October Horror Movie Challenge hosted by Krell Laboratories. Kickstart Your Weekend: CHILL style! Zatannurday: Return of the Fish-net Brigade!